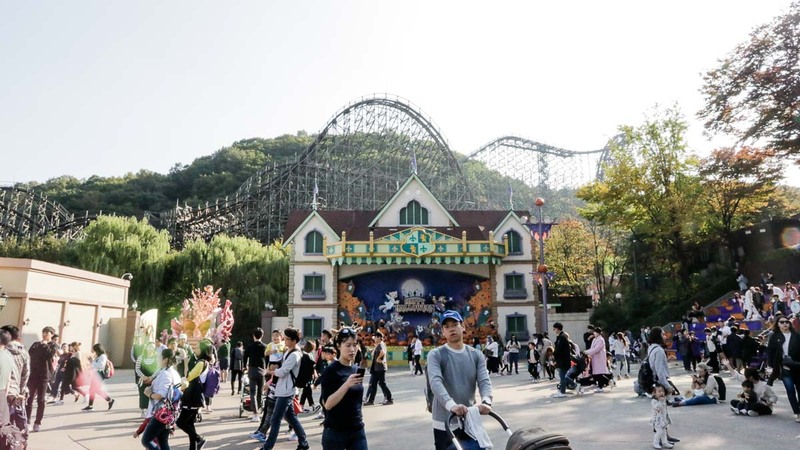 Being the largest theme park in South Korea, Everland’s sheer size is enough to send some into panic attacks. Not only are there both outdoor and indoor rides, there’s even a zoo within its compounds! 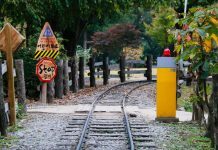 Also, situated in Yongin, getting to Everland is an adventure itself as taking public transportation can take up to 2-hours from Seoul city. 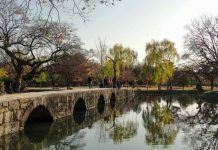 Like most people, we sought to find remedies and hacks to make our trip to Everland an easier and cost-effective one. So, we’ve come up with the guide below. Half the battle is won when you are armed with a comprehensive Everland guide. Tickets can be purchased from the ticket counters at Everland itself, but honestly, no one queues up for tickets anymore. Save time by getting your entrance tickets before even getting there! We got ours via Klook — an authorised reseller of Everland. 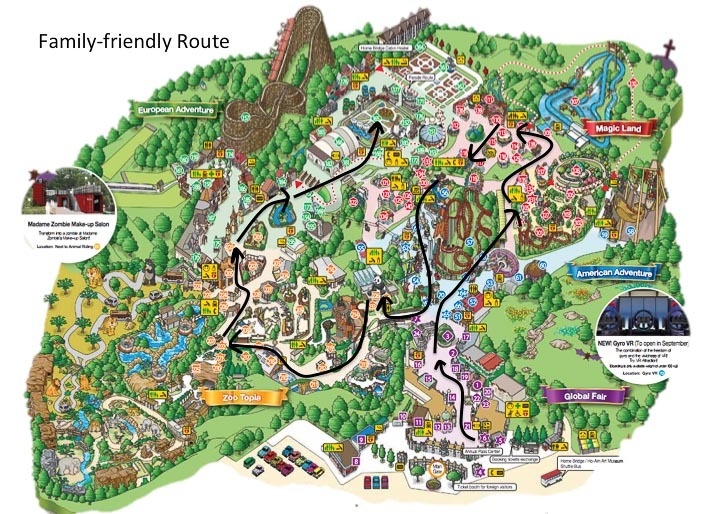 There are several ways to get from Seoul to Everland. We went with option (4). 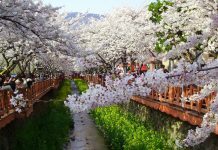 For₩12,000, there is an Everland shuttle bus that leaves from central locations within Seoul such as Hongdae, Myeongdong, Gangnam, straight to Everland. You can pay for the ticket when you board the bus. Alternatively, you can pre-purchase the same transport on Klook for S$12. 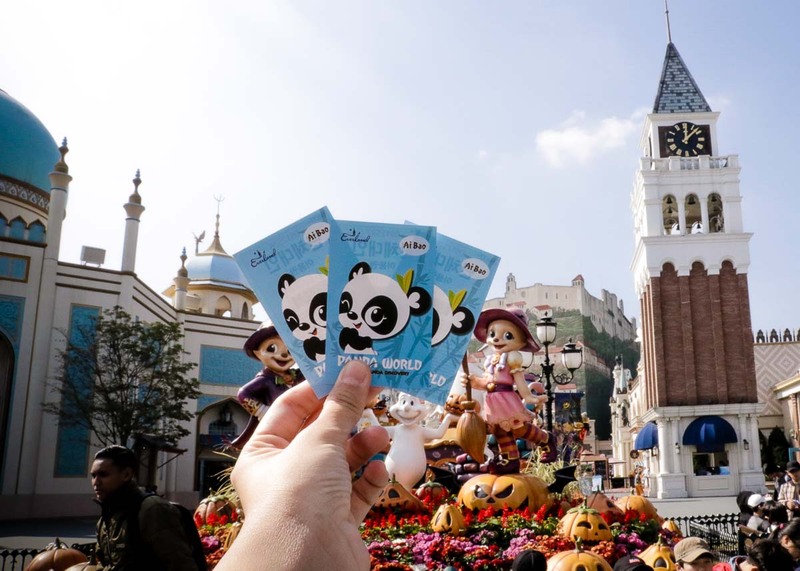 Besides the shuttle bus, Klook also has a Full-Day Everland Package which includes Everland Tickets as well as round-trip transport to and back from Everland. For S$63, not only is it already cheaper than the Everland Tickets itself (₩54,000), the ride was convenient and we got there in 60 minutes from Myeongdong. What we liked about this was that the pick up wasn’t too early and we only left 15 minutes after the park closed. This gave us the chance to catch the evening show and fireworks whereas the shuttle-bus only options did not. Other than the obvious weekends, try to avoid Summer vacation (mid-Jul to mid-Aug), Chuseok Holidays a.k.a “Korean Thanksgiving Day” (15th day of the 8th lunar month), Christmas, and New Year. *Pro-tip: Purchase the Q-Express Pass to skip the queue on your favourite rides if these dates are unavoidable. 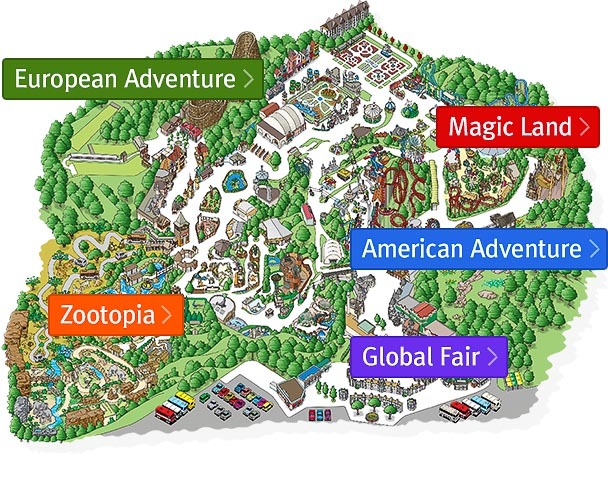 There are five themed zones in Everland, starting from the main entrance in an anti-clockwise direction: Global Fair, American Adventure, Magic Land, European Adventure, and Zootopia. There are paper maps available at the entrance and most stands, grab a map and orientate your way! Take note of the rides you absolutely must experience before leaving. 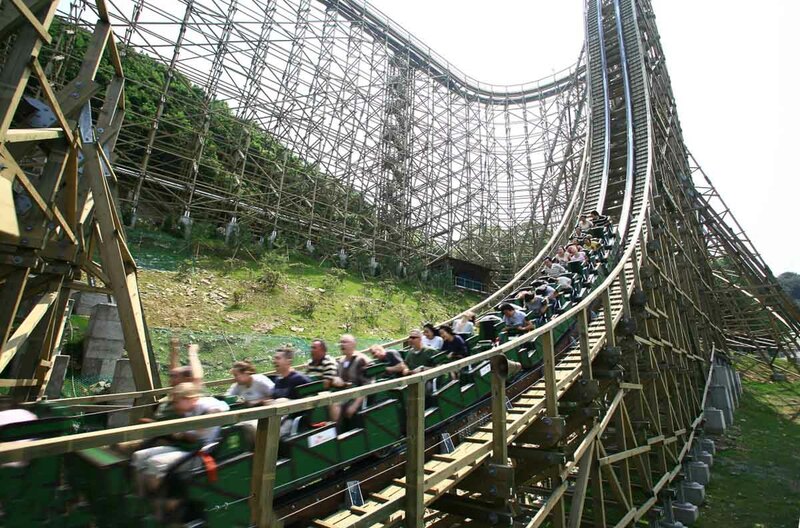 Our unanimous favourite was the T-Express — one of the most exhilarating wooden roller coasters in the world. 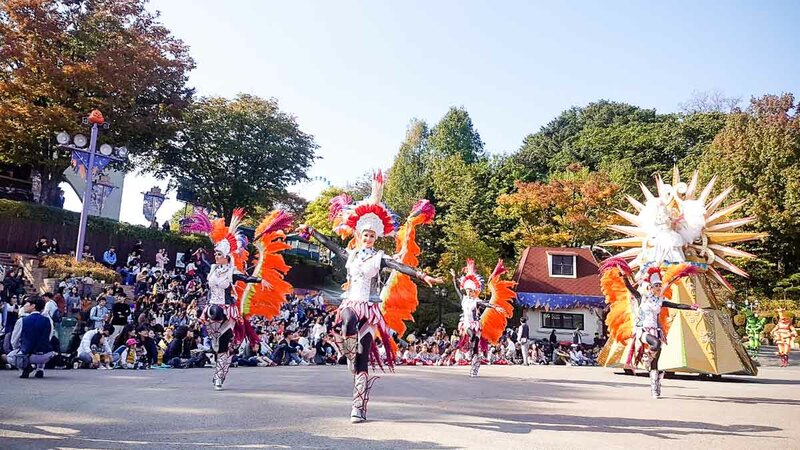 There are no printed programme lists in Everland, so do take note of programme timings if you are interested in watching performances or catching the parade. *Pro-tip: Programme timings are flashed on the TV screens at the entrance, so snap a picture with your phone or camera for easy reference! *Pro-tip: Arrive early for the parades and fireworks show to secure a good viewing spot. Adrenaline junkies, here’s a highly recommended route for you. 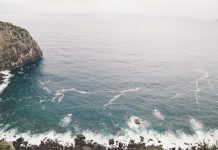 While this is the most logical route for thrill-seekers, don’t limit yourself when you are there! Be open to changes (in case certain rides are close) and try other rides that are not listed here! Credit: Everland Resort’s pinterest. T-Express Roller Coaster. 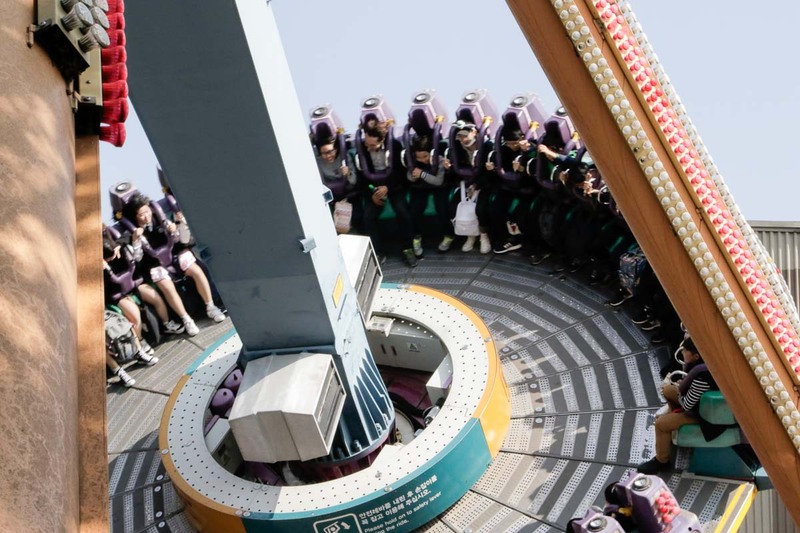 The first wooden roller coaster in South Korea, T-Express remains a top favourite to both locals and foreign visitors of Everland. 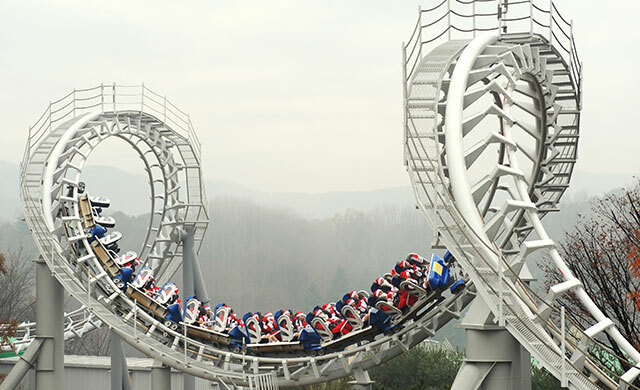 With speed topping at 104km/h and a vertical drop height of 77º, T-Express is really not for the faint-hearted. *Pro-tip: If you’re purchasing only 1 Q-Pass ticket, T-express is the one you should purchase for. There are no single-rider lanes for this ride, and waiting time can go beyond 200 mins on weekends or holidays. You know the future is now when Virtual Reality (VR) is incorporated into rides. 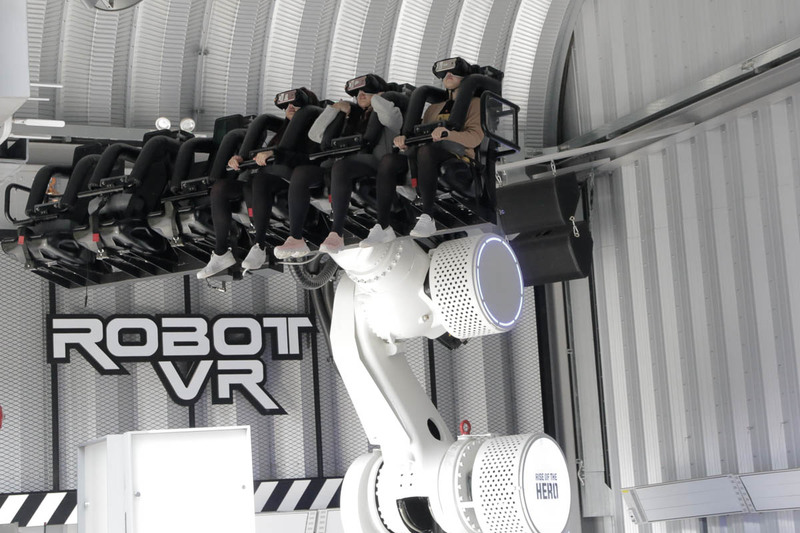 In Everland, there’s the Robot VR that allows riders to experience rides like never before, turning 360º on a robotic arm, while looking through VR goggles. Note: You’ll need to pay a separate fee of ₩5,000/pax for this ride. Payment via T-Money or credit card only. A rotating pendulum roller coaster that allows riders to feel what’s it like being caught in a hurricane. This ride is more fun than scary and if you’re lucky, you might even catch a staff dancing along with funky moves to the tunes. Ever wondered how being in a washing machine feels like? Wonder no more. The Double Rock Spin spins riders at 360º for 5 to 6 consecutive rounds while blasting rock music you’ll never hear anyway as everyone will be screaming at the top of their voices. Folks who are prone to motion sickness might want to give this ride a miss. This ride is a mini roller coaster that boosts spiral rotations and two complete 360º loop-to-loop sections. While it’s not the scariest ride, it sure will leave one feeling disoriented from all the twists and loops. 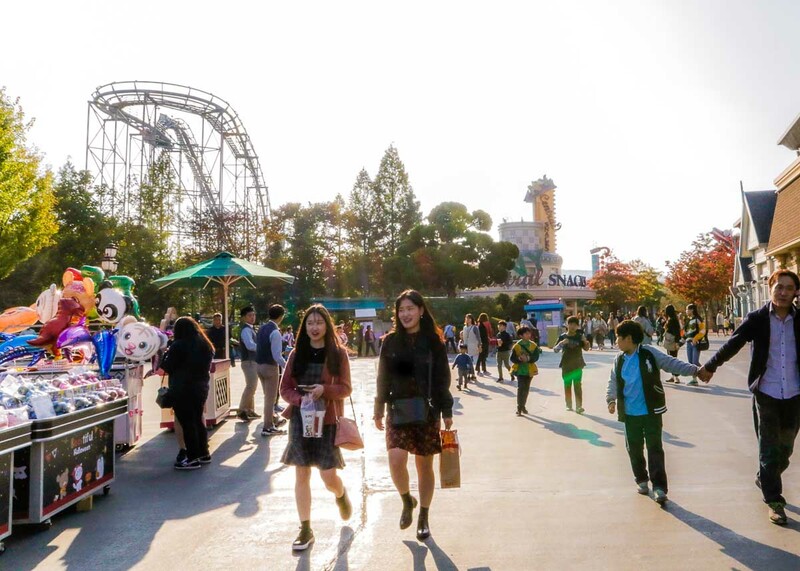 One reason why Everland is so popular among people across ages, is that there are many different zones that cater to guests of different age groups and interests. If you are travelling with young kids or older folks, you might want to spend more time in Global Fair, Magic Land, and Zootopia. In Global Fair, there are a couple of retail shops such as cosmetic shops Etude House, and even a LINE Friends Store. In Magic Land, there are semi-adventurous rides for the little ones who enjoy some breeze in their hair. There’s the Magic Swing, Bumper Car, and Helicycle, which are enjoyed by all ages. Then, head over to Zootopia and get up-close to animals such as lions, tigers, giraffes and more! 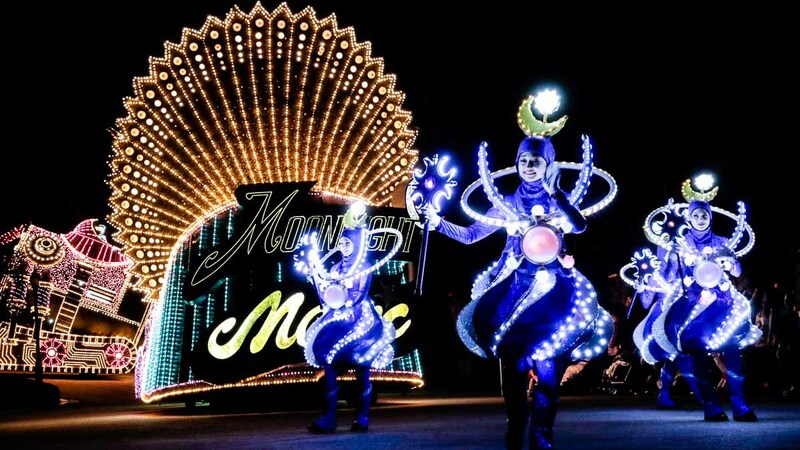 Lastly, catch the night parade and fireworks before calling it a day. Only planned half a day for Everland? 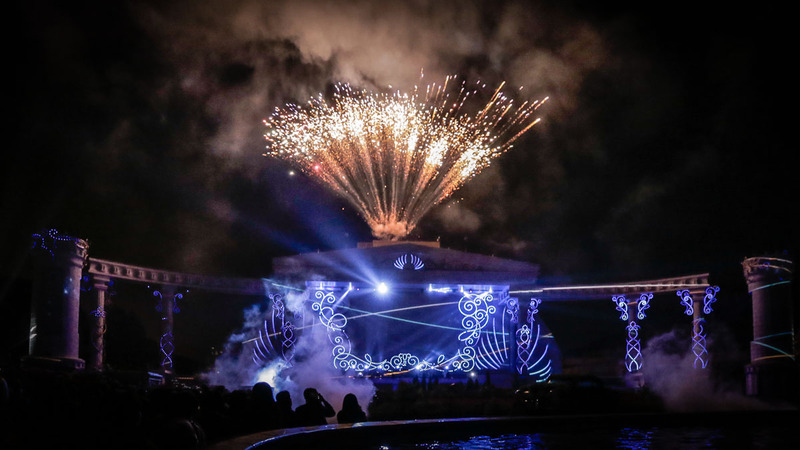 If you’re not a FOMO freak, it will be good news to know that the best of Everland can be conquered within just 4 hours. Skip the kiddy Magic Land entirely and just focus on American and European Adventures. 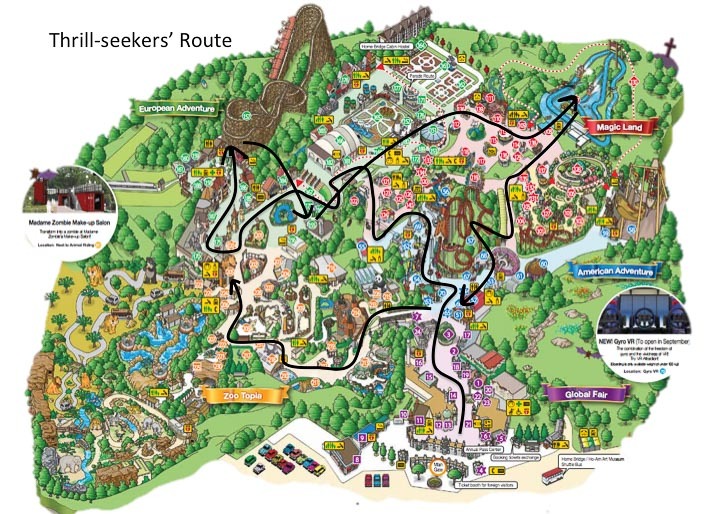 *Pro-tip: Ask theme park staff for shortcuts and the fastest routes to your intended locations. Earlier on, we mentioned the Robot VR Ride that was a paid facility. Other than that, there are other paid facilities within the park which are worth your bucks. 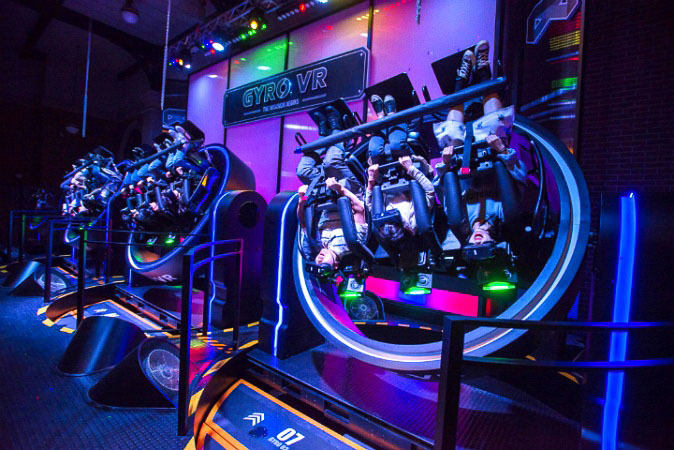 The Gyro VR, another VR ride, brings players on an alien-invasion ride with its 360º spinning rig. 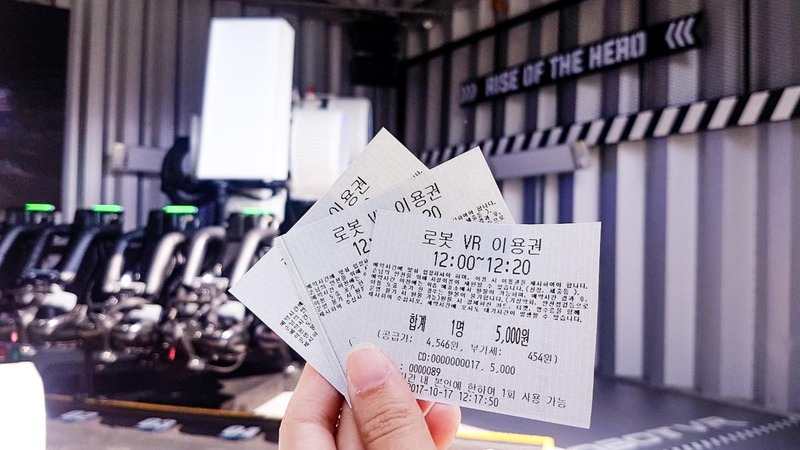 Similarly to Robot VR, there’s a fee of ₩5,000/pax for each ride. 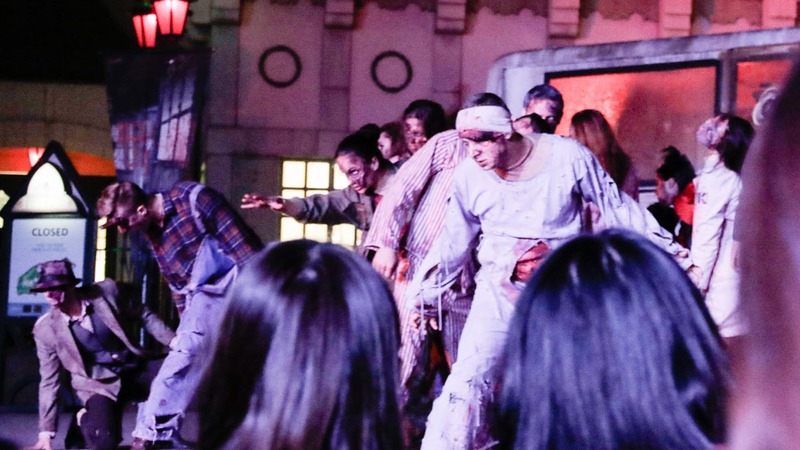 Other paid facilities include the Live Hologram at ₩3,000/pax, and the Horror Maze at ₩5,000/pax. Although we did not personally get to experience these paid attractions, we’ve heard great things about them. So do give them a try if you have enough time and credits on your T-Money. There are many food stalls within Everland’s various themed zones. If you are looking for a variety of options, head to Holland Village, where 12 European style restaurants with 1,000 outdoor seats. 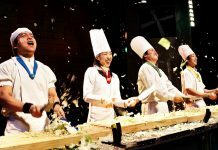 If Korean cuisine is more towards your liking, there’s the Korean restaurant Han-ga-ram that serves up free portions of Tteokgalbi 떡갈비 (short rib patties) with every course menu ordered. 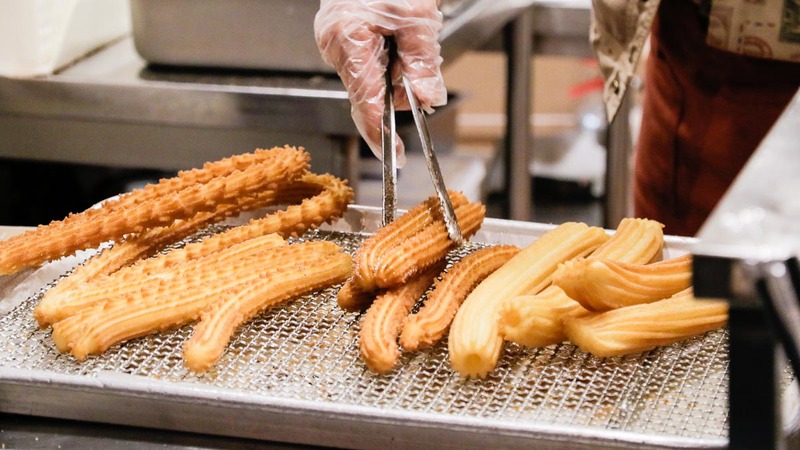 Also, theme park staples such as Turkey Leg and Churros are also available at various snack stands within the park. *Pro-tip: Outside food can be brought into Everland, so that saves you some money as we all know food in theme parks can be expensive. We personally bought rolls of Kimbap from Myeongdong station which were really yummy and a convenient snack to have on the go. *DO NOT hold the food items in your hands when entering rides, however, as they will be confiscated. The Grand Emporium in Global Fair is the largest retail shop in Everland. Make this the last stop of your day in Everland for final purchases as it is located just next to the main entrance/exit. *Pro-tip: Leave your shopping to the last to save time! Since Grand Emporium has most, if not all, of the merchandises you find in the smaller gift shops of each themed areas anyway. 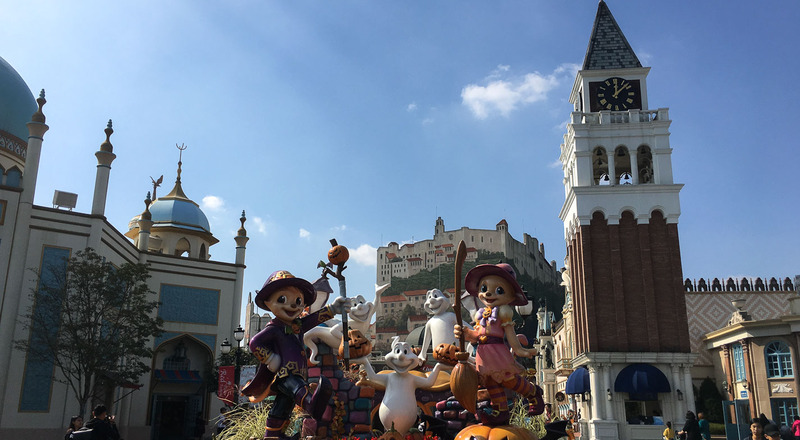 When we visited Everland in October, the entire theme park was decorated with Halloween elements. Also, the park extended its closing hour to 10PM, which made it a real good deal as we had more time to utilise our day tickets. An additional Halloween themed zone, Blood City, was also set up. In it, there are activities such as haunted houses, VR rides, and games for guests. The T-Express, Amazon Express, and Horror Safari continued their operations well after sunset. Experiencing the rides in the night does add to the thrill and scare factor. Do look out for upcoming festive events during the Christmas period if you are planning a trip to Korea this year-end when Everland transforms into a big winter wonderland. 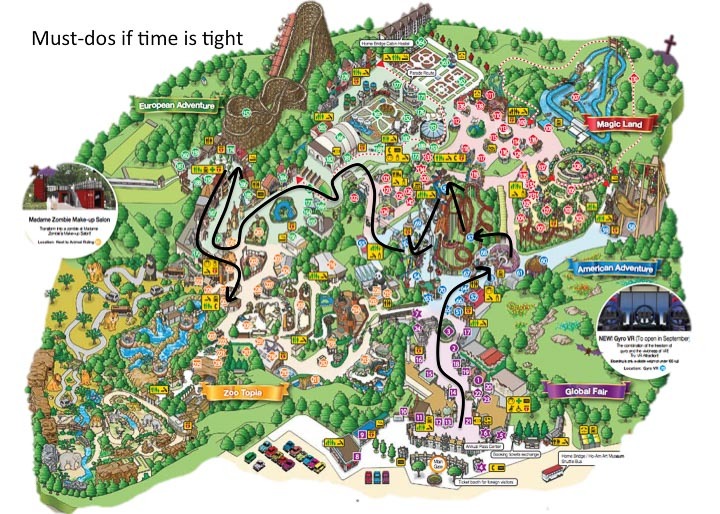 Also, although certain rides will be closed during winter, there will be sledding activities set up in Everland! 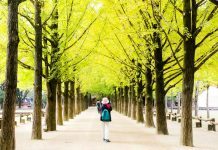 Besides having Everland tickets at discounted prices, you can also get your travel essentials such as SIM card, Discover Seoul Pass, and dining vouchers at cheaper rates when you purchase from Klook. If it’s your first time purchasing on Klook, use promo code <TTIKLOOK> for S$5 off! I visited Everland this May and I really enjoyed it. I was not able to ride the T express because it was closed due to strong winds. My favorite zone is Zootopia. Sorry to hear but glad you enjoyed yourself! Everland is a nice place, I am seeing it for the first time online and have the wish to visit the place in the next holidays. I spent today (15th August) at Everland theme park with my wife and just back to my hotel in central Seoul to find 44,000 was taken from my wallet whilst I was on one of the rollercoaster rides. I know for a fact it was during my time on Rolling X Train rollercoaster ride as it was the only time I was without my wallet! I had placed my wallet in my wifes handbag as I thought it would be safe by putting it there ONLY after the staff had requested I remove anything in my pockets and put it in the shelving area next to the exit area of the ride. We’re planning on visiting around Halloween 2018. What are the dates you’ll celebrate your Halloween Theme ? Can we come dressed in our Halloween Costumes? Hi Leah, we’re uncertain of Everland’s plans as we were simply sharing our experience! There might be news on their official site and social media pages! Hi, thank you for sharing your experience. Am planning to go this coming november. I understand you waited for the fireworks at 9.30pm. Did you make it on time to the shuttle bus at 10.15pm? Bcoz i went there b4 and if I’m not mistaken I remember four seasons garden is quite far from the entrance/exit. Everland’s closing hours will be different in November, but as long as you’re booked on the tour that includes the transfer, the shuttle bus will only depart after the fireworks. Hi, We will entre Everland on 9/11/2018. It is cold weather? My travel agency said no advisable to visit Everland during cold weather. They said a few game will close. 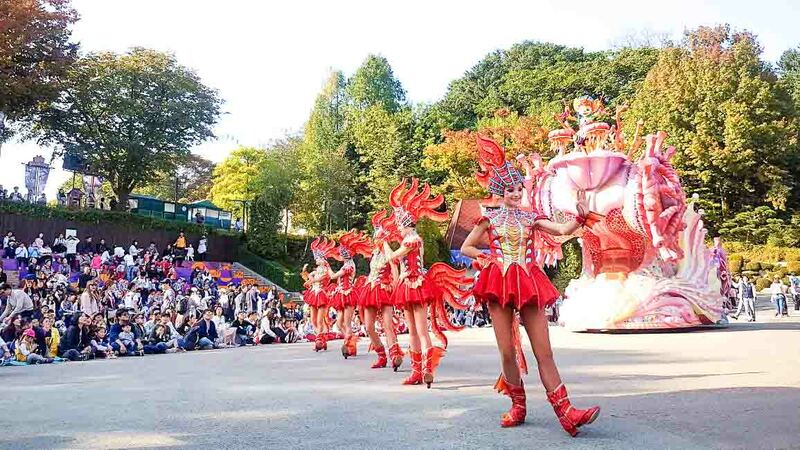 Yes, it will be cold in November, but you’ll be able to enjoy Everland’s special Halloween festival (until 11/11/2018). hello, ill be going to seoul this coming January, is it ok to go to Everland during this time? Everland will still be open in January, but outdoor rides such as T-Express may not be operating due to the cold weather. If you are more keen on taking the roller coaster rides, I’ll not advise you to visit Everland in winter. There will, however, be winter-themed attractions ongoing as well such as a sledding hill. So if you’re into winter activities, Everland can be quite fun too! How frequently the shuttle bus run from Jeondae Everland Station (near Ramada Hotel)? I plan to take my whole family with 7&10 yrs old kids with my parents 70+ yrs old. Thanks for your question, but we’re afraid that we are unable to assist you on this as we didn’t take the shuttle bus you mentioned. It should be frequent as the shuttle bus ride itself from Jeondae Everland Station to Everland is only 5 mins. Thanks & have fun!